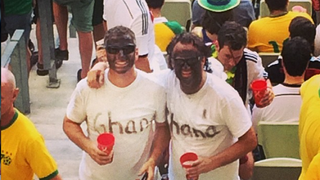 FIFA has started a probe into the matter of two men wearing blackface during Saturday’s World Cup Group G game between Germany and Ghana at the stadium in Fortaleza, Brazil, the Daily Mail reports. According to the report, images spread across social media showing the two men, who were wearing identical outfits, with curly Afros and their faces blackened. It is usually left up to national football federations to ensure that their fans behave appropriately inside stadium grounds. FIFA said that it has already looked into the matter and is moving forward with disciplinary procedures against Mexico. “'We can confirm that we have been contacted by Fare. Prior to this, disciplinary proceedings were opened against Mexico for improper conduct of spectators during the match Mexico-Cameroon,” FIFA said in a statement.